iderdider....: well fed this wednesday. I made this recipe as a dare. It sounded gross. The photos were not appetizing. There was the strange little combination of hard boiled egg, tasty meatball and pork rind (I made myself feel slightly better about by referring to them as Chicharrón). FYI Chicharrón really stink. But, as mentioned, I've already blazed through a ton of the recipes in Well Fed and none have disappointed. Plus, I had all of those eggs that the kids dyed from Easter. 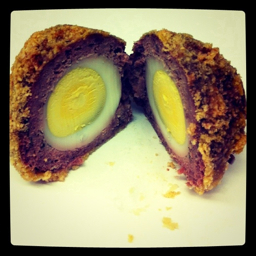 So, I braved the recipe for Scotch Eggs, similar to this one, but with slightly different spices. Everyone in my house LOVED them. Ingrid, who does not realize that one is not supposed to think a hard boiled egg inside a pork rind covered meatball is delicious, ate with abandon. Claire declared them really good. Everett's was missing the egg because of his stupid no-egg diet. Thank you, naturopath. Nate and I were fans. I may have been a tiny bit disappointed when he took the last one to work. Most of the recipes you post look and sound awesome...but I admit this one looks a little odd. Your rave reviews + the reviews off the linked site are intriguing enough I might try making these. :) Hope things settled down for you tonight.